A whole new perspective on cleaning automotive glass. Glass is not a perfectly smooth material. It is made up of microscopic grooves that can become filled with dirt, debris, and oils from the world surrounding your vehicle. Glass cleaners can remove what is on top of the glass but the only way to remove what in the glass is Diamondite Glasswork Cleansing Clay. Diamondite Glasswork Cleansing Clay removes bugs, overspray, tar, oil, tree sap mist, rail dust, and environmental pollutants. It even removes mineral deposits that haven’t yet etched the glass. There is no gentler, more thorough way to clean glass. Detailing clay is an elastic compound capable of grabbing debris lodged in a porous surface and trapping it to completely remove it from the surface. All clay requires a lubricant to work safely. 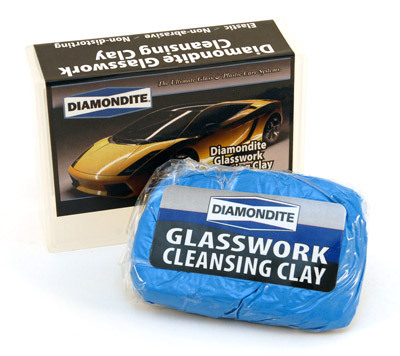 Diamondite Glasswork Cleansing Clay works hand in hand with Diamondite Glasswork Clay Lubricant to protect automotive glass as it is cleansed of stubborn impurities. The slippery lubricant allows the clay to glide over the glass, picking up contamination as it goes. After claying, glass will appear clearer and feel incredibly slick to the touch. You may not even be aware that your car’s glass could be clearer, but Diamondite Glasswork Cleansing Clay will give you a whole new perspective on clean glass. Try it as part of the Diamondite Glasswork Kit to experience a total makeover of your vehicle’s glass.